The new Nexus 9 from Google is good for work and play. One of the stunning features of Nexus 9 is that it joins your family of Android devices, so whichever one you're on, your music and movies can be immediately enjoyed across all of your Android devices. Why not transfer your favorite Blu-ray movies to Nexus 9 and enjoy them on the go? If you temporarily have no idea about what to do, you can take this tutorial into consideration which is introduced in the following paragraphs. This article will teach you how to rip a Blu-ray for playback on Google Nexus 9 easily and fast. To do the Blu-ray to Nexus 9 conversion task, you're highly recommended to use EaseFab Blu-ray Ripper. With a few clicks, you can convert Blu-ray to Nexus 9 successfully so that you can watch Blu-ray movies on Nexus 9 anywhere anytime. And if you want to rip your Blu-ray videos to other formats, it can also satisfy you since it can convert Blu-ray movies to many other popular video formats like MOV, MKV, FLV, AVI, WMV, etc. If you're using a Mac, simple turn to EaseFab Blu-ray Ripper for Mac, which allows you to transfer Blu-ray to Google Nexus 9 on Mac OS X(including Yosemite and Mavericks). Now download the right version and follow the tips below to finish your task. 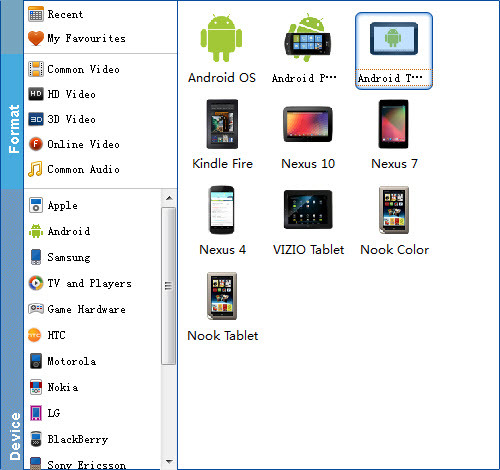 Once you do this, you can begin the process to convert Blu-ray files to Nexus 9 by clicking the Convert button. All the conversion tasks will be done at fast speed and you will get a high output quality. After the conversion, click "Open" to locate the converted video files and then transfer them to your Google Nexus 9 for watching on the go with ease.